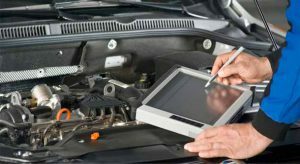 We offer a full range of diagnostic services for our customers. Our professionals know how to handle a wide range of car electronic systems. Our mechanics strive to ensure that your vehicle will be performing at its best before leaving our service centre. We have a very modern engine scanner that can communicate with your vehicle's on-board computer and ready any faults that it may have. Our scanner reads faults from as little as an engine temperature sensor to as serious as an Anti Lock Brake safety fault. It can even retrieve stored faults from your car's computer that have happened in the days heading up to when you bring it in for service. We can handle any problem on a vast range of vehicles.